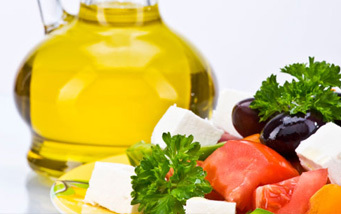 There’s no one “Mediterranean” diet. At least 16 countries border the Mediterranean Sea and ‘diets’ vary between these countries and also between regions within a country. Many differences in culture, ethnic background, religion, economy and agricultural production result in different diets. But the common Mediterranean dietary pattern has these characteristics: high consumption of fruits, salads and other vegetables, bread and other cereals, potatoes, beans, nuts and seedsolive oil is an important monounsaturated fat source, dairy products, fish and poultry are consumed in low to moderate amounts, and little red meat is eaten, eggs are consumed up to four times a week, wine is consumed in low to moderate amounts. Like fats, carbohydrates can be both good and bad. Good carbohydrates are found in foods such as fruits, vegetables, salads and whole grains. The not so good carbohydrates are found in products made with sugar (sweets, snacks, and sugary drinks) and refined grains (white bread, white pasta, and white rice). Sugars and other refined carbohydrates are digested rapidly and can cause surges in blood sugar and insulin. You can avoid taking a ride on the blood sugar roller coaster, and help avoid weight gain, by eating more good carbohydrates in the form of salad and other vegetables and whole grains. Good carbohydrates take longer to digest, so blood sugar and insulin rise more slowly and peak at lower levels. My practical nutrition suggestion – Be colourful! One way to tell if you are eating well is to look at your plate! How colourful is your food? Salad and other vegetables with deep, vibrant colours, like spinach leaves, tomatoes, and broccoli, contain phytonutrients, powerful plant compounds that are important to good health.